We don’t talk about it because a woman’s hair is her crowning glory. When it suddenly starts to fall out, we try to ignore it. Clumps of hair sitting on the shower drain, or building up in a brush or in the corners of the bathroom floor can signal something is wrong. But most women ignore it. That is until they realize that they don’t have the lush hair they once had. Menopause and childbirth are just two common causes. The disruption to hormone levels, heredity, various illnesses, a lack of iron and stress can all bring about hair loss in women. It’s not like balding in men which is often expected and accepted. It is totally different. For women it can be a great shock. And it is more common than you think. In fact more than 50% of women will experience thinning hair at some point in their life. For many women the visibility of scalp showing through where lush hair once was, brings on feelings of gloom and despondency. Getting our hair done, having a great hair day and dressing to impress are all fading memories as the realization that there’s a problem everyone can see, hits home. It’s possible to cover up thighs and flabby tummies, but not so easy to cover up thinning hair. That is, until now. Finally there is a product for women with thinning hair. There have been many products developed by men, for men, but until now there has been nothing for women. 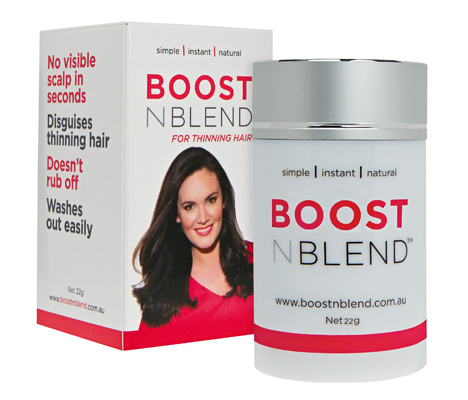 BOOSTNBLEND™ is a thinning hair concealer for women. This is a totally new concept in women’s hair care. For the first time there is an instant fix for women with thinning hair. Great hair days are back and the end to embarrassing gaps has finally arrived. BOOSTNBLEND™ is made up of tiny hair-like microfibres that cling to each individual hair shaft making each hair look thicker. Thus covering up the scalp. BOOSTNBLEND™ comes in 8 colors to match the majority of women’s hair colors. It simply shakes in, lasts for days and washes out. A very clever product, developed by women for women. 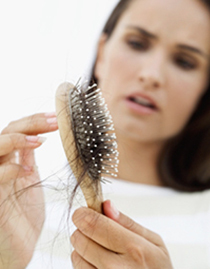 Many women can treat their hair loss with hormones, vitamins and medication. But the great news is, no matter what has caused the hair loss, whether temporary or permanent, BOOSTNBLEND™ can cover up the problem.